We have a new challenge starting at Time Out Challenges today. Flowers with the optional twist of Kissing-this is where you use 2 stamps to make one image-here is a tutorial of this technique. I didn't use the technique for my card. I did have a try but wasn't so happy with the result! I made my fav kind of card-just stamping and do love the clean look and fresh and spring colours. 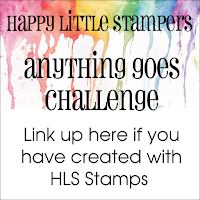 The 2 large flowers here are from our Sponsor for this challenge Happy Little Stampers. These flowers are from the set Doodled Flowers. Our DT have all made fabulous cards-check them out here and then get inky. 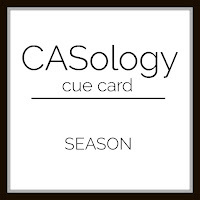 CASology-Season-I went all Spring here! So elegant and still modern and with the colours a warm card...such a clever make; I keep looking at it... Hope you have some sunshine today! Gorgeous card Sandie ! I love your CAS style, it works so perfectly ! Love these spring colours ! Thanks for sharing and for inspiring. Fabulous CAS card. The colors are perfect for the season! What a great CAS card! Thanks for joining us at Just Us Girls! This is a great Spring CAS card, Sandie. Thanks for sharing it with us at Addicted to Stamps and More. I love this Sandie! I especially love the sentiment on the yellow - so vibrant and makes it stand out so beautifully. Doodled flowers is such a cute set and I love your idea for using colored ink for stamping outline flowers. Great look and perfect for CAS! Love this CAS beauty. Those flowers look wonderful. Thanks so much for playing along at CASology this week. I really need to use colored cardstock for my sentiments like you did. Love the extra pop of yellow. Loving these bright and zesty colors, nice stamps for using colored inks and no coloring needed. You're the Queen of CAS, Sandie, and this fresh, pretty card is simply more evidence! 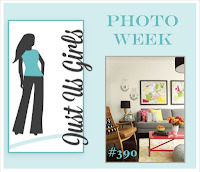 Thrilled you shared this gem in the Addicted to Stamps and More gallery! 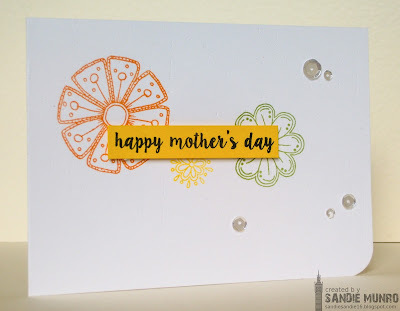 Really pretty Springtime colour combo - and I love how you used coloured cardstock for the sentiment! Really pretty card!